The Windblock Bodysuit has 3 layers and is waterproof and windproof! It offers the most warmth and protection of all bodysuits. 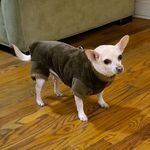 Windblock fleece is a unique fabric that is designed to insulate the body from cold temperatures down to frigid conditions. The outer layer is a velvety rich fleece that feels as soft as butter. It is water repellant to fight off the elements as well as stains. The textured inner layer of fleece adds more insulation. Sandwiched in between these layers is a polyurethene barrier to completely block the wind, wet snow or rain. 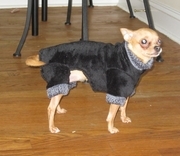 Your dog will be warm in the harsh winter even down to frigid weather. Windblock fleece is used by the leading sportswear manufacturer, Patagonia, for their active winter R4 jackets. The outside layer dires in minutes, and the inside layer never gets wet. It should never be worn inside. Machine wash in cold water, and air dry. Our Windblock Bodysuits provide outstanding warmth and comfort, as well as great looks!